The Lions Club of Doutta Galla received confirmation of Charter on 12 May 2011, under the guidance and support of our Sponsoring Club - the Lions Club of Taylors Lakes, along with our wonderful Guiding Lions Steve Gordon (LC of Coburg) and Murray Baud (LC of Taylors Lakes). The following is the congratulatory letter for the newly chartered Doutta Galla Club, dated 18 May 2011, from PDG Carol Anderson, MD Club Extension Chairman. "Congratulations on the chartering of Doutta Galla Lions Club. Please forward my personal congratulations and that of our Multiple District 201 to all new members. A new club is certainly just cause for celebration, not only for your District, but for Lions Clubs International to ensure our humanitarian work continues. Please give my sincere congratulations to Charter President Robyn Falloon, Charter Secretary Susan Phippen, Charter Treasurer Justin Bourke and Charter Membership Chairman Stan Falloon. All Charter Members within the club have made a personal commitment to ensure the Doutta Galla Lions Club will succeed and should be commended. Together with Guiding Lions Murray Baud and Steve Gordon I believe that this club will succeed in their service goals. Please accept my sincere acknowledgement of your teams work and commitment in the formation of this club including the sponsoring Lions Club of Taylors Lakes. I believe that this is the first club in Australia which has chosen its name in respect to the indigenous owners and history of the area and hope that this may lead the way for clubs in the future. I congratulate and welcome each and every new member and look forward to hearing of their success stories in the future." Our formal Charter Celebration Dinner was held on Friday October 14th 2011 at the Moonee Valley Racing Club. It was attended by over 100 Lions and guests who helped us to celebrate this special occasion. Melbourne Djembe soon had us dancing to the fabulous rhythms of their African drums in a very different and thoroughly enjoyable bracket of entertainment. Our Certificate of Incorporation has arrived, on the same day as the confirmation of the ABN registration, and the Tax File Number!! 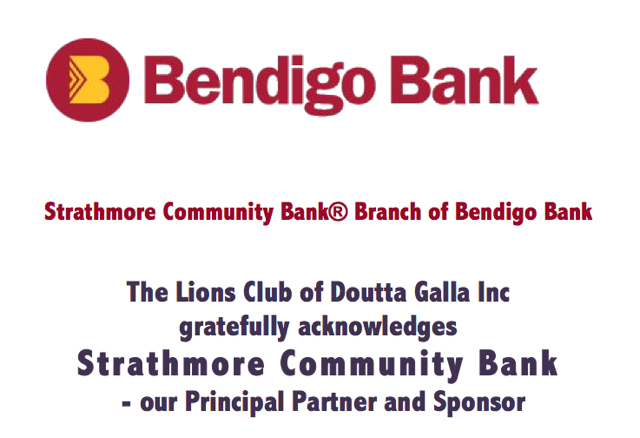 A day to log in the Lions of Doutta Galla history pages. The Lions Club of Doutta Galla is chartered within Lions Mulitple District 201 (Australia) and Constitutional Area Vll (Australia, New Zealand, the Pacific Islands and Indonesia). It is part of an international association formed in Chicago in 1917, and is filled with like minded people who are joined by the common desire to make their communities better, by using their creativity, enthusiasm and energy. Lions form lifelong friendships in a network which reaches across the globe. Lions provide amazing leadership and training opportunities for those who wish to take their involvement in Lions further. Membership is open to all people of the community of good moral character who will uphold the Lions Purposes and Ethics.